"Le Negre Marron" (The Black Maroon; in Creole, "Neg Mawon"), Port-au-Prince, Haiti, often translated in English as the statue of the "Unknown Slave". The "Negre Marron" is shown with left leg extended (broken chain on his ankle); a machete in his right hand, and his left hand holding a conch shell to his lips. The conch shell was often used as a trumpet to assemble people. Created by the Haitian sculptor, Albert Mangones, the statue was commissioned to commemorate the slaves who revolted against France from 1791 to 1804. End the Racist System of Modern Day Slavery! An Injury to One Is an Injury to All! All for One and One for All! (5 Feb 07) The National Human Rights Committee of the Canadian Union of Postal Workers is teaming up with Shunpiking Magazine to publish a special four-page Black History Month tabloid for its members. (8 Feb 07) The Monsoon Journal, a new English-language monthly tabloid published for Toronto's Tamil community, has teamed up with Nova Scotia's Shunpiking Magazine to publish a special 12-page Black History Supplement. Our Timeline, "A People's Odyssey", is brief, but aims to convey the broad sweep of historical forces shaping the Black communities. Slave trade apology is inappropriate - The United Kingdom must atone and pay REPARATIONS, Not Ghana! With the abolition of the slave trade in 1807 and the Emancipation Act of 1833, Britain washed its hands of slavery. Not so, according to MARIKA SHERWOOD, who sets the record straight. 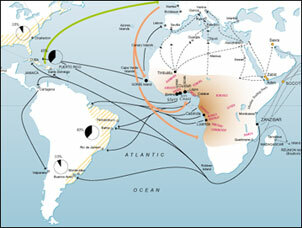 Britain continued to contribute to and profit from the slave trade well after 1807. Drawing on government documents and contemporary reports as well as published sources, she describes how the trade in women, men, and children and their enforced labour remained very much a part of British investment, commerce and empire. A stark, silent beauty grotesque emerges from a place whose hidden past was the setting of heinous crimes against the African people. A photo essay by BOB SEMPLE of a visit to the Île de Gorée, Senegal. The Ivy League Yale University, located in New Haven, Connecticut, was the first to be forced to admit to its pro-slavery past by three doctoral students. Now Brown University has also made a similar admission. Nanny of the Maroons stands out in history as the only female among Jamaica's national heroes. She possessed that fierce fighting spirit generally associated with the courage of men. Carlota, a slave woman, took up the machete in 1843 to lead a slave uprising at the Triumvirato sugar mill in the great plain of Havana-Matanzas, the emporium of the slave-owning oligarchy. In the struggle against the slave trade and slavery waged in Britain during the eighteenth and nineteenth centuries, African and Caribbean people played a key role. Chartist leader Cuffay was arrested on the evidence of informers. Still defiant, he pleaded not guilty to the charges of 'levying war against the queen', and denounced both the government and those who tried him, while championing the struggle for the rights of working people. The life of Mary Ann Shadd, 1823-1893 - noted African American anti-abolitionist and educationalist. Text of the UN draft resolution designating 26 March 2007 as the International Day for the Commemoration of the 200th Anniversary of the Abolition of the Trans-Atlantic Slave Trade. - UN News Agency report on the debate in the 61st general Asembly. (1787) One of the first and most radical Africans in England to fight against slavery. (1944) Our 27-page excerpt from Dr Eric Williams ' seminal work, Capitalism and Slavery. "Slavery was not born of racism: rather, racism was the consequence of slavery. Unfree labor in the New World was brown, white, black, and yellow; Catholic, Protestant and pagan." The US Constitution ratified in 1787, although never mentioning slavery by name, refers to slaves as 'other Persons' in Article 1, Section 2; 'such Persons' in Article I, Section 9; and a 'Person held to service or labour' in Article IV, Section 2. Throughout the constitution the term 'Person' also refers to those not held in involuntary servitude.